At St Chad’s, we believe that all children should have the opportunity to access high quality PE and Sport so that they can develop key skills in a broad range of physical activities and lead healthy, active lives. Every child takes part in a minimum of 2 hours physical education each week; we aim to inspire every child to enjoy physical activity. Through the introduction of the new curriculum, our sports provision enables children to become physically more confident in a way that supports their health and fitness. In Key Stage One, children develop fundamental movement skills, become increasingly competent and confident and access a broad range of opportunities to extend their agility, balance and coordination, individually and with others. They engage in competitive (both against self and against others) and co-operative physical activities, in a range of increasingly challenging situations. In Key Stage Two, pupils continue to apply and develop a broader range of skills, learning how to use them in different ways and to link them to make actions and sequences of movement. They communicate, collaborate and compete with each other, whilst developing an understanding of how to improve in different physical activities and sports, and learn how to evaluate and recognise their own success. pupils are taught to swim competently, confidently and proficiently over a distance of at least 25 metres, use a range of strokes effectively and perform safe self-rescue in water. In addition to high quality P.E. 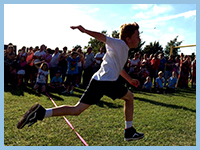 lessons, the children can participate in a range of inter and intra school competitions using our sports facilities. We believe that by providing opportunities for children to compete in sport, key values, such as fairness and respect, will be embedded. We work with local primary and secondary schools to organise ways in which the children can compete against other individuals and teams to enjoy the thrill of competition and apply and develop their sporting skills. 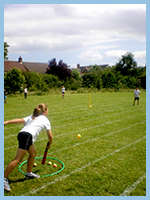 At St Chad’s, we also hold regular intra sporting competitions, the latest of which enabled the children to develop their Scatterball and Kick Rounders skills. Children develop leadership skills by working towards the ‘St Chad’s Sporting Leadership Award’, which enables them to work with children across the school in developing sporting opportunities for all, whilst considering Health and Safety in their delivery. Encouraging children to lead healthy and active lives is important to us. There are plenty of cycle and scooter racks at St Chad’s and our Year 5 and 6 children benefit greatly from their Cycling Proficiency lessons. Sporting achievements are celebrated in our Friday morning I.C.A. (I can achieve) assembly. Children have the opportunity to participate in a wider range of after school activities, such as Rugby, Gymnastics, Dodgeball, Multi Skills, Cricket, Football and Athletics, which often lead to competitions. These are provided by staff and external sports coaching companies. We follow the advice the DfE advice in PE and Sport Premium Funding for Primary Schools. For further sporting information and updates, please see our newsletters (Newsletter Section of Website).